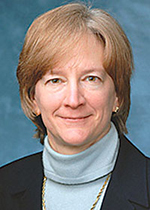 Elizabeth Perlman, MD, professor of Pathology and co-author on a research letter published in Nature. A large-scale genetic analysis of pediatric cancers identified several notable trends in mutations and allele expression, according to a research letter published in Nature. The authors, including Elizabeth Perlman, MD, professor of Pathology, said the findings emphasize the genetic differences between pediatric and adult cancers and provide a foundation for further investigation. Perlman is also a member of the Robert H. Lurie Comprehensive Cancer Center of Northwestern University. While studies like these, called pan-cancer analyses, have previously been performed for adult cancers, the current project is the first time investigators have examined a large pool of samples from pediatric patients. According to the investigators, adult cancers frequently develop from the epithelial tissue that lines the outer surfaces of organs, blood vessels and cavities throughout the body, but pediatric cancers often occur in developing mesodermal tissue — a distinction with genetic implications. To learn more, the investigators used whole genome, exome and transcriptome sequencing to identify common mutations among paired tumor and normal tissue samples from 1,700 patients with pediatric cancer. The scientists found 142 driver genes in the cancerous tissue, only 42 percent of which match those found in adult cancer studies. Driver genes are mutations that increase net cell growth, which can contribute to a variety of cancers. The scientists drilled down further, identifying the mutant allele that was transcribed in 34 percent of the study’s protein-coding mutations. Investigating the specific mutant allele involved in each mutation allowed the scientists to assess the effects on the larger gene while providing an opportunity to detect any epigenetic regulation that might have generated this mutant allele in the first place. In addition, 11 genome-wide mutational signatures were identified. Mutational signatures are a combination of mutational processes that are known to lead to a specific cancer. The authors said this type of analysis is especially useful in cancers that arise from inherited gene mutations, rather than those caused by outside sources such as smoking or ultraviolet radiation. The findings in this study will be an important resource for future investigations, providing a large database of functional data that will be useful in studying and implementing clinical genomics, according to Perlman. Perlman contributed the sequencing information for the genetic landscape of pediatric renal tumors (Nature Genet. 49:1487, 2017; PMID 28825729). The authors have made the mutations, genes and pathways examined in this study available online.